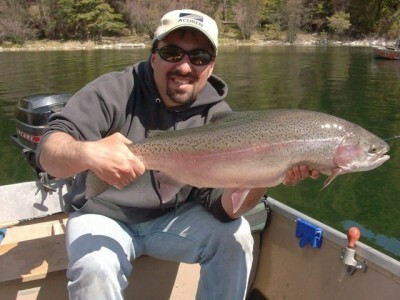 Krazy's Nine Pound Kamloops Area Lakes Rainbow! Today’s lake might sit at about 3600 feet, might be in the Roche lake area and might be named after a certain animals footwear – but then again it might not – and if not, we’d bet money that it’s not that far from there. 😉 Either way it was another productive day of Kamloops chironomid fishing resulting in fish to ……. ready for this ……. NINE pounds! After yesterdays eight pounder we moved on to different waters not expecting to even come close to that number. We picked another lake known to grow rainbows fast and used our BC Lakes on Google Earth tool to ensure that it had been stocked with the “right” type of fish (can you say triploids) long enough to allow them to reach acceptable weights. We arrived at the lake around 10:00 AM and were very pleased to see that a chironomid hatch was just getting under way. After unloading the boats and getting set up we were on the water looking for signs of fish and upon locating a few dropped anchors and started fishing. JeFF started with his usual searching chironomid, AKA the KKK, while I worked a black n red and and Adam worked a leech. The plan was to try and catch a fish, use the throat pump to take a feeding sample, and then fine tune our flies accordingly. Again as usual, JeFF struck first with a bow that hammered his presentation and immediately took him into his backing. 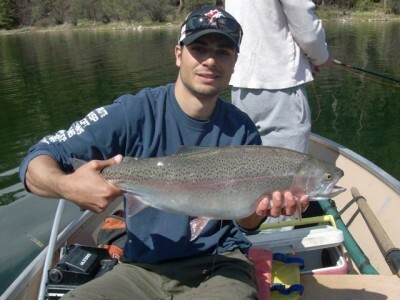 He quickly regained control and about five minutes later brought this beauty rainbow to the net! another day … another beautiful bow! A quick sample with the throat pump revealed that JeFF didn’t have to fine tune his fly after all but Adam and I should – so we did – and almost immediately we also started getting into some nice rainbows! After an hour or so of fairly steady catch and release fishing with trout around the two pound mark, Adam hit a fish that felt like it had some good weight to it and after good few minutes of fight, including a few great runs, pulled this gorgeous bow into the net! Fast forward another couple hours of on again off again fishing when finally I hit a fish that felt “better than average” – and that’s exactly what I remember thinking, that it felt “better than average” – until I got it near the boat and all hell broke loose that is! Suddenly it became very clear that this bad boy was quite a bit “better than average” and my heart kicked into high gear as this “submarine”, as JeFF called it, nose dived to the bottom of the lake wear he sat and pulled and tugged and shook his head and generally scared the crap out of me thinking that my little knot was not going to be able to take much more of this pounding! Finally, after what seemed like an hour, I was able to ease this brutes nose into the net and finally get a good look at him. Well all I could say was holy $hit as all of our jaws dropped at the sight of this monster! Krazy’s May 11, 2010 Nine Pound Rainbow! Unbelievable! Just yesterday we managed to land an eight pound bow and had concluded that it would be a long time until we topped that feat and then the very next day we hook into this nine pound beast! The fishing Gods, for reasons that we don’t understand, must be happy with us – or maybe it’s just luck or karma – we’re not sure but we’re definitely not complaining! 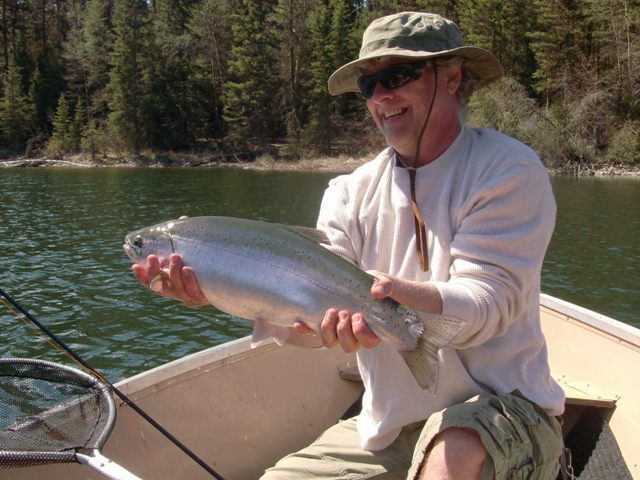 This entry was posted in Fishing Reports and tagged Chironomid Fishing, Deep Water Chironomids, Horseshoe lake, Kamloops Area Lakes Fishing Report, Long Lining Chironomids, Roche lake. Bookmark the permalink.